I want to know Christ and the power of his resurrection and the sharing of his sufferings by becoming like him in his death, if somehow I may attain the resurrection from the dead. God was replacing the old covenant he made with Abraham and his descendants with a new covenant that was far superior. It was not so much that the old covenant was defective. What was defective was the Jewish understanding of that covenant. It had become merely a set of rules to follow. What was lost was an understanding of what was behind the rules. What did the rules actually convey? Judas must have understood Judaism as a set of rules to obey. He questing why Mary did not spend her money on the poor rather than on costly perfume. Does not the law require us to look after those who are less fortunate than ourselves? It does, but there was something deeper going on here with Mary’s costly gift. Mary loved God with all her heart. She understood the foundation of the law. If we are not careful, a rules based Christian faith can distract us from what is really important. Judas was locked into his limited understanding of the law. He was sitting under the teachings of Jesus daily, but he did not comprehend what Jesus was offering. He did not know who Jesus really was and is. He did not understand the ministry of Jesus. Satan had tricked him. If we are ruled based in our faith then Satan is better able to manipulate our thinking and reasoning. Judas was painting by the numbers, making sure not to go outside the lines. Mary saw the law of God for the work of art that it is. Who are we today, Judas or Mary of Bethany? We might easily protest that we would never betray our Lord like Judas. But we do betray him if we refuse to grow in our faith. Otherwise, we tend to judge others by our rule based understand of the faith. We become a stumbling block to others. Our Christian walk and witness becomes parched and dry. We are part of God’s chosen people. He has formed us for himself. Are we able to declare his praise? Are we able to love him with all our heart, soul, mind, and strength? We are if we open ourselves us to his refreshing Spirit who is ready to teach un new things and give us greater understanding. When one embarks on the spiritual life; when gives their heart, mind, and soul to Jesus, he or she will soon encounter challenges to their faith. Will God provide for us and protect us? Is he faithful? Is his Word true? Satan is quite good at engineering circumstances in our lives which cause us to doubt our faith. Satan tests our faith. We are in good company. He tested Jesus. Do we really trust God to take care of us. 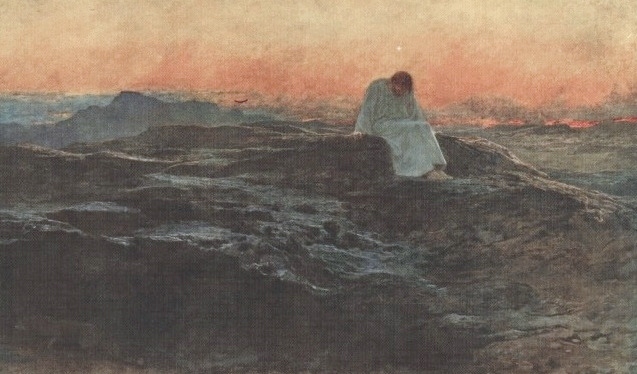 Jesus was all alone in the wilderness. He had no one to provide for him except God the Father. Satan tempted Jesus to move away from his complete trust in God, suggesting that he should take matters into his own hands. Let us look back at our own history. Has God proven himself trustworthy in providing for us? Satan had another test waiting for Jesus. This temptation may seem a strange one at first. Jesus is the Second Person of the Godhead. He is the agent of all creation. The world was made through him. Humankind has fallen and brought sins and death into the world. Satan is now the ruler of this age. Jesus emptied himself of all divinity and power when he came to earth as a babe. What he knew and understood was what he studied from the holy scriptures. He relied upon the Holy Spirit to help him interpret them. His life and ministry were governed by his relationship with God the Father through prayer alone. Satan was offering Jesus an alternative earthly kingdom that would avoid suffering, humiliation, and pain. What Satan offered he could actually deliver. Many people have sought fame and fortune by selling their soul to the devil. The key to God’s protection is our relationship with him. We need to cultivate and nurture that relationship with his help. Things do not always go our way. God may not be responding to our prayers soon enough for us or in the manner that we wish. So Satan tells us that we must prove ourselves because no one else will. Satan tempted Jesus to prove that he was the Messiah. Jesus knew, however, that only that he would show himself to be the Messiah was by the cross. He came with a mission to save humankind. Our mission is much more important than our position. But what does it say? Our foundation is knowing that God is good and that his Word is true. Satan will try to steer us away from this belief. He will fail when the Word is in our minds and written on our hearts. The Season of Lent is a time of fasting and prayer for the Church. It corresponds to the time of preparation that Jesus spent in the wilderness before beginning His earthly ministry. Scripture tells us Jesus was led there by the Holy Spirit for forty days of fasting and prayer. Thus, Lent begins with the service of Ash Wednesday and runs through Holy Saturday, the day before Easter Sunday. This time period is actually forty six days, because the six Sundays in between the beginning and end of the Lenten Season are not really part the days of fasting. Sundays are always days of celebrating the resurrection of our Lord. Historically, in the Easter Church, Lent has provided a time in which new converts were prepared for Holy Baptism. This practice is still observed in many liturgical churches. Why should we observe this time of preparation and what does it mean to each of us and the Church today? Clearly this observance is not required for salvation. The saving act of Jesus on the cross and our response to His loving sacrifice is required, followed by our endurance in the Faith with His help. Nevertheless, we cannot deny that life does present us with wilderness experiences. What is false is a church that suggests that Christians should not have them. We do have them. Job stood head and shoulders above his peers as a righteous man in his day, yet he experienced a terrible wilderness experience. The false triumphalism found in some of today’s churches would have us believe that such experiences should not occur, bringing condemnation on those who go through them because they do not have enough faith. If we have wilderness experiences as a matter of course then why designate an appointed time to go through one within the Church Year? Is not this appointed time artificial? It is my belief that the Season of Lent in the early church was very much influenced by the Holy Spirit. Perhaps it is better to observe a wilderness experience appointed by the Holy Spirit than the one that is unscheduled and catches us by surprise. We may still endure unscheduled ones but we might be better prepared for them, having benefited from the teachings and disciplines of Lent. Jesus required preparation in the wilderness through the Holy Spirit in order to begin His ministry on earth. He experienced other wildernesses as well, Gethsemane being one of them. Our purpose for Lent should be the same purpose that Jesus had for entering the wilderness: to prepare for ministry. We all have a ministry if we are Christian believers. Lent should be a time of fasting and prayer, self-examination and repentance, and reading and meditating on God’s holy Word. It should be a time of setting aside the things of this world that so easily creep in and devote ourselves more to God and His Word. What should Lent not be? It should not be about our attempt to impress God by what we are giving up for Him or ny what spiritual gymnastics we are putting ourselves through. The “giving-up” notion is fundamentally flawed. It makes us dread Lent. We then cannot wait for Lent to be over. That is why Mardi Gras or Carnival has such an appeal for many people. Too often Lenten promises are like New Years resolutions. We make them but we don’t keep them and then we are under condemnation. Satan has a field day with us. He loves our false humility and piety. God does not want us to prove who we are. He wants to prove who we are, if we will allow him to do so. He is the author and finisher of our faith. We just need to submit ourselves to him. It is said that we often grow through our struggles and trials. This may be true, but it is not necessarily true. A greater truth is that our struggles do teach us that we cannot get through life on our own strength alone. The struggles often drive us to God. It is God who then changes us and not our struggles. Why should we wait for a crisis to go to God? Why not go to Him early and often? Perhaps the best observance of Lent would be to approach God with faith in the saving blood of Jesus, asking Him what He would have us discover about ourselves and about Him. Let Lent be a time of intentional fellowship with God in prayer, seeking His will and wisdom for our lives so that we might be better disciples of Jesus Christ and living examples of God’s love for the world.